Little Bunny's Bible by PJ Lyons is an adorable little book for young readers! When I first saw this book, I fell in love with the packaging. It comes in a plastic little pouch showcasing the sweet, soft, bunny. It appears to be perfect to give as a gift. So that is what I did! It worked great for a baby's first Easter gift. 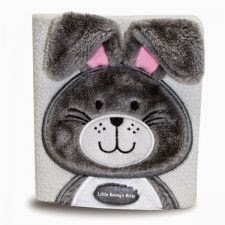 The cover is so creative, soft and fluffy with the lettering on the front that says, Little Bunny's Bible. My one concern is the fact that the words are an iron-on and I wonder if they will wear off over time. Other than that this book is sturdy for little readers! I was surprised how few pages were in this book considering it is labeled a Bible. But, there are a handful of Bible stories such as The Creation and Noah with colorful pictures that little ones will enjoy time and time again! Disclaimer: This book was provided by the Book Look Bloggers program.